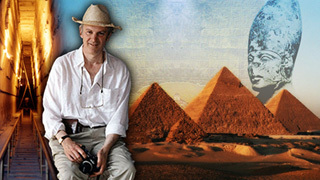 Professor Robert Temple is the author of "The Sirius Mystery", "The Sphinx Mystery" and "The Crystal Sun". We'll discuss his latest book, "Egyptian Dawn", a fascinating look into the real history of the ancient civilizations, including revelatory new evidence which challenges accepted truths about the history of Egypt. Robert talks about a new dating method called "optical thermoluminescence". He also will talk about the age of the pyramids, undiscovered tombs and his descent into the Osiris shaft. Temple unearths new evidence which challenges accepted truths about the history of Egypt and questions the evidence which most Egyptologists have relied on since 1910. Topics Discussed: dating stone, Giza, valley temple, Sphinx temple, redating the pyramids, optical thermoluminescence, carbon 14 method, the Laritzis dating method, truth, Colonel Henry Vyse, Caviglia, Chefren Causeway, the Osiris shaft, Chephren, Mycerinus, dacite sarcophagus, vandals, water shaft, caves and tunnels underneath the Giza plateau, draining channel, stalactites. We proceed where we left off in the first hour with Robert and discuss the seven previously undiscovered tombs. Two of these tombs might actually be the real tombs of Chephren and Cheops. Robert gives us his take on Edgar Cacey's Hall of Records and where this actually might be located. Robert has been making extraordinary finds both at the valley temple and the Sphinx temple. Later, Olivia Temple joins us to talk about some of her experiences with the inspectors from the Supreme Council of Antiquities and how she perceives life in Egypt to be like today. Topics Discussed: seven undiscovered tombs, the real tombs of Chephren and Cheops, Reisner, Sneferu, Hall of Records, Uvo H�lscher, viking optical lenses, museums in Stockholm, The Supreme Council of Antiquities, inspectors, the people of Egypt today, Gantenbrink's Door, new discoveries and more.